If you like a good before-and-after, then today’s your day! Why? 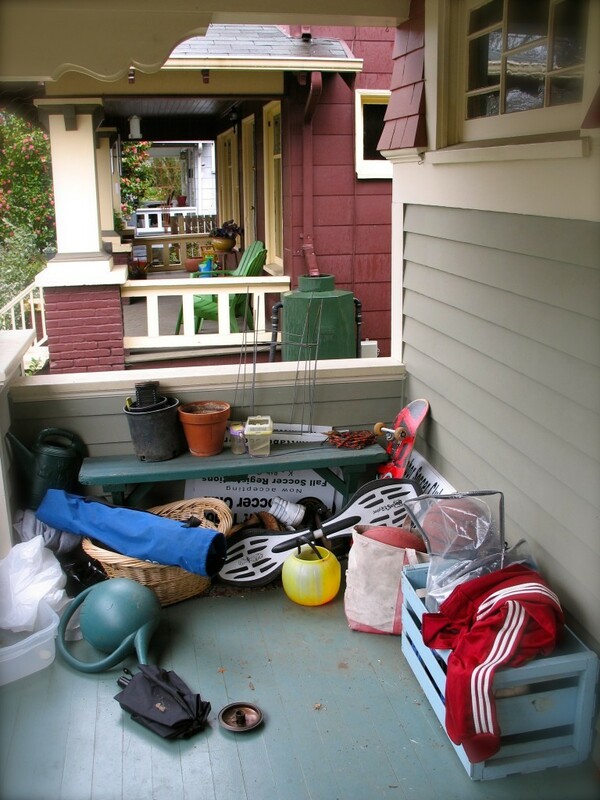 Because this is the before of my front porch. Yes, it’s from a few years ago, but it’s cluttered and unattractive enough to make the inevitable after nice and dramatic. I want you to notice the “rug” in front of the couch. It’s a $1 carpet sample that I picked up at a garage sale. The proportion is hilariously off. Here’s another view, from before I fixed up this great table using a $2 piece of Goodwill fabric. But I came across a rolled up rug that someone had set out for free a few weeks ago. Nothing special, just an industrial nap with a decidedly non-natural fiber. But it was free, so what did I care? It was slightly grubby, so I hauled out my Bissell rug shampooer and freshened it up. 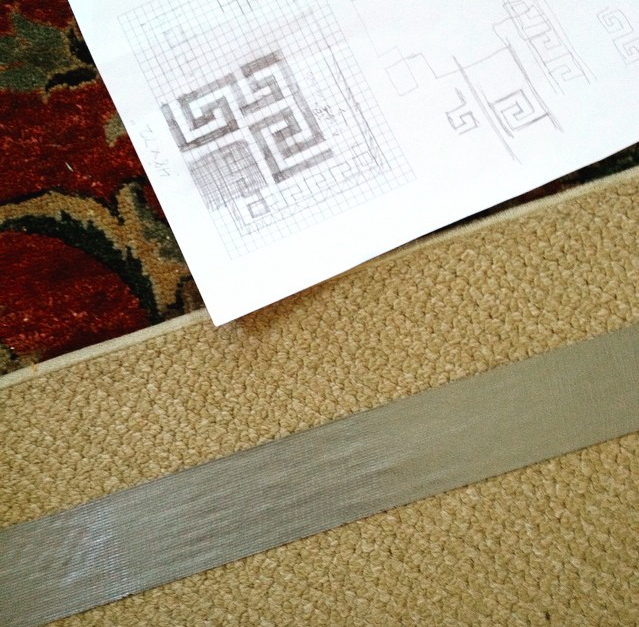 My initial plan was to tape off an elaborate Greek key pattern for a border, and even went to far as to graph it out. But then I came to my senses. A dozen hours of snipping precise pieces of tape might drain my already waning sanity. So I taped off two concentric rectangles, which was much more within my mathematical skill set. At this point you may be noticing that I’m using duct tape instead of precious blue low-tac tape. Why? 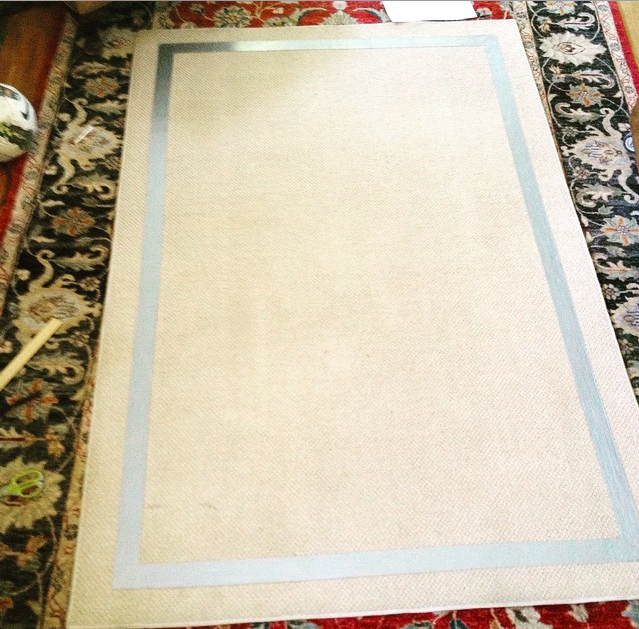 Because that tape is designed for use on delicate painted walls, and this is a seriously indestructible rug. Plus, I had a roll of oddly warped duct tape that I pulled from a free box a few years ago. I didn’t want to spend any money on this project. I went and shopped my basement, and chose a no-VOC forest green paint that was leftover from painting our entryway. It probably would’ve been faster to use a small paint roller, but I couldn’t find a paint tray, so I used a regular paintbrush. It took more paint than I anticipated, as the rug really soaked up the paint, but the gallon was almost full so this was not a problem. In all, the project took probably took an hour-and-a-half, including trips to the kitchen to refill my ice tea glass. And here’s the finished product! Simple, yet elegant. I actually think that the Greek key design would have looked overwrought and fussy in this small space. 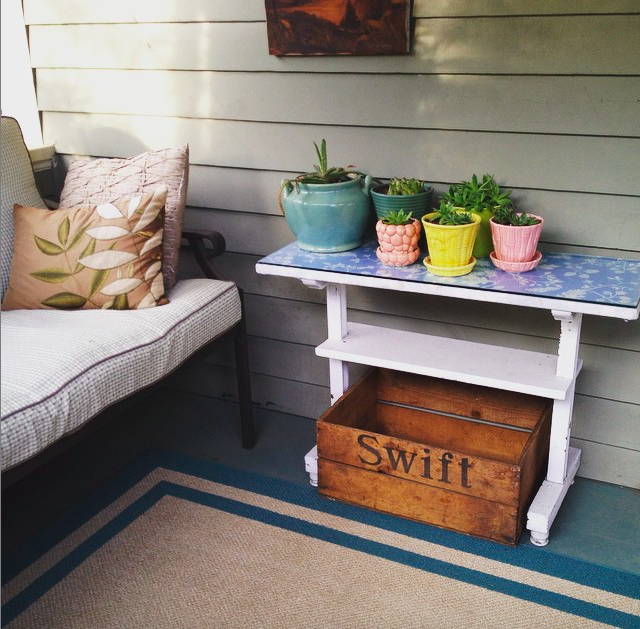 Here’s another view of the porch, which shows how my free-pile “Swift” crate fits perfectly under the table. The only things I paid for in this seating area are the couch and matching chair. $40 total. This is once again a situation where having a limited budget, or frankly no budget is not so much a barrier as it is a benefit. It exercises my creative mindset to create the look I want. And it keeps otherwise under-appreciated items out of the landfill. And now, I’m off to enjoy a lovely cup of tea on the porch. Lovely outcome, Katy!! You’re so lucky to have a covered spot for some light refreshments, and not the high heat, humidity and thunderstorms were enjoying(? )in St. Louis! Your posts are a continuous source of inspiration as my husband and I live in a rental house while getting our dream home built! Thank you! Looks super, Katy! I noticed your couch and chair appear to be wrought iron. What sort of spray paint do you recomment for freshening up wrought iron? I want to make my old patio table and chairs look new! I don’t think you can get the wrong kind of spray paint. Although I’m a fan of the paint-plus-primer in one. Just ask at the hardware store. The whole arrangement looks so inviting. Being creative is so much more fun than just spending money. I absolutely love what you have done with this rug! I am shocked you can actually PAINT a rug! So creative. 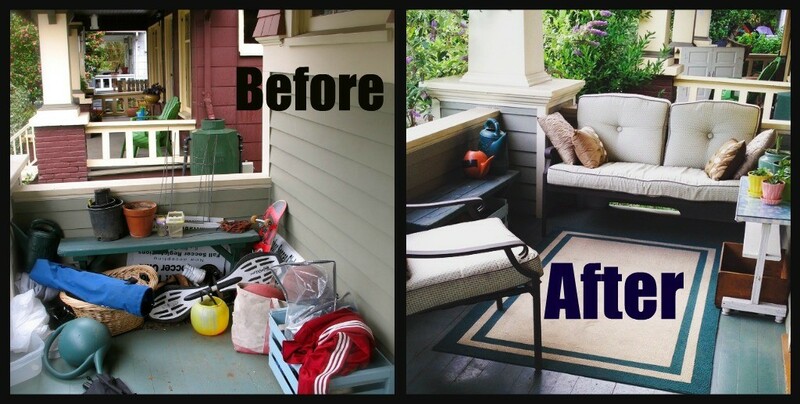 And your porch looks great. The great thing with doing projects with free supplies is that you can take risks without worrying about wasted money. Another amazing transformation. Thank you for sharing and I hope you enjoyed your tea on the porch. I love that space- you have really designed it well, especially with a small budget. And the rug turned out beautifully!! It does look inviting. Though at my house, my husband would be laying things on the furniture and ruining the tranquillity!! Wow, looks like a great place to sit and read! 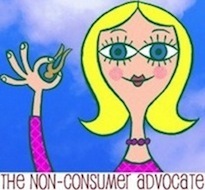 See, I consider myself frugal to a certain extent, but not THAT kind of frugal (creative), unfortunately. 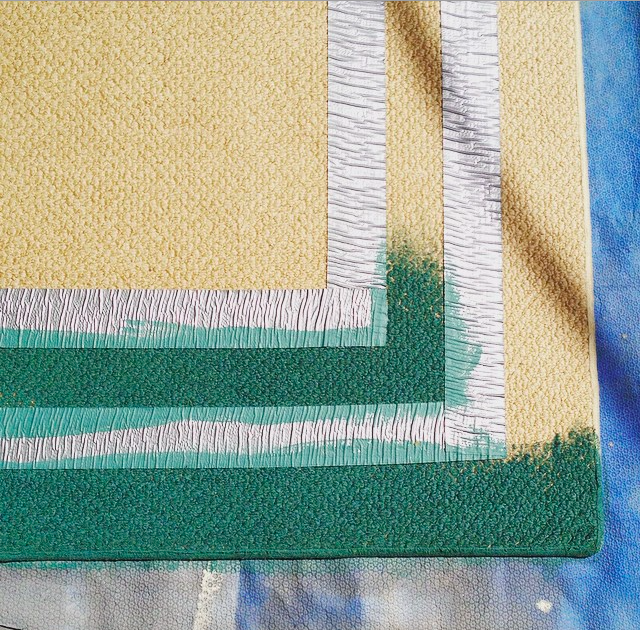 To me, the idea of getting a rug, then apply paint to it is just too much work (yes, I despise manual work that much!). I would end up leaving it plain, and this is why my “decor” is so ordinary I guess…. I now have 4 a-little-rusted outside metal chairs (the kind that you put a big cushion on) I am thinking of throwing out and buying new ones… what would YOU do in my situation?? Are they still sturdy? If so I would just buy a couple cans of paint-and-primer-in-one spray paint and freshen them up. Multiple thin layers is the key. The “oil rubbed bronze” is a great color and looks terrific. I did all my mismatched doorknobs and backplates, and they turned out perfectly! Also the concentric rectangles is more of a “classic” pattern and is less likely to becomes SO 2010’s like the greek key pattern. Greek Key is a classic pattern that’s been around far longer that five years, hence the name. The thinking that something that was popluar a mere five years ago is “over” is anti-NCA, in my opinion. The secret is to chose classic things you absolutely love, and keep them as close to forever as you can manage. Then blithely ignore those who declare that this thing or that thing is “In” or “Out”. I hope I misunderstood and that this was actually just a joke that sailed over my head. Very nice! I never thought of painting a rug before. Nicely done. Wow Katy!!! Would never have thought of painting a rug! It looks amazing!!! Love this. I was just at the eye doctor looking at a Southern Living. 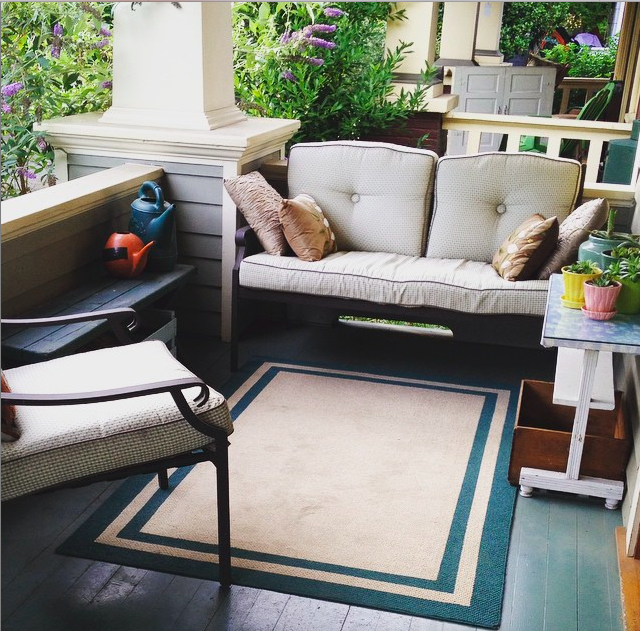 One article was entitled “the $500 porch renovation.” They were pretty porches, but I would never spend that much money on stuff to sit on my porch. Mine is populated with free cycle furniture and ferns my mama kept from last summer. I love it!!! Makes me want to drive over to Goodwill and demand they sell me an equally awesome outdoor patio set. I’m sure they’ll agree, right? I have been lucky enough to be on your peaceful porch. Creative, inspiring and darn scrappy are you Katie! Thanks for helping us help others!!! 1) Using our relatively inexpensive township pool membership. It’s nice, clean, and has plenty of shady spots surrounding the pool. 2) made a lemon/chicken/ red pepper recipe last night using lemons that were about to head South. Combined the remnants of 2 little bags of bulk purchased rice to accompany the chicken. 4) found out that our library allows you to “check out” passes to local museums!! We’ll definitely take advantage of those this Summer! 5) had a lovely excursion to Hershey Amusement Park on-the-cheap. It goes without saying that we packed lunch and drank tap water. Later in the day we split a pizza- the most economical dinner option in the park. wow, you’ve really transformed those spaces. great paint job too. I might do something similar for our outdoor spaces. 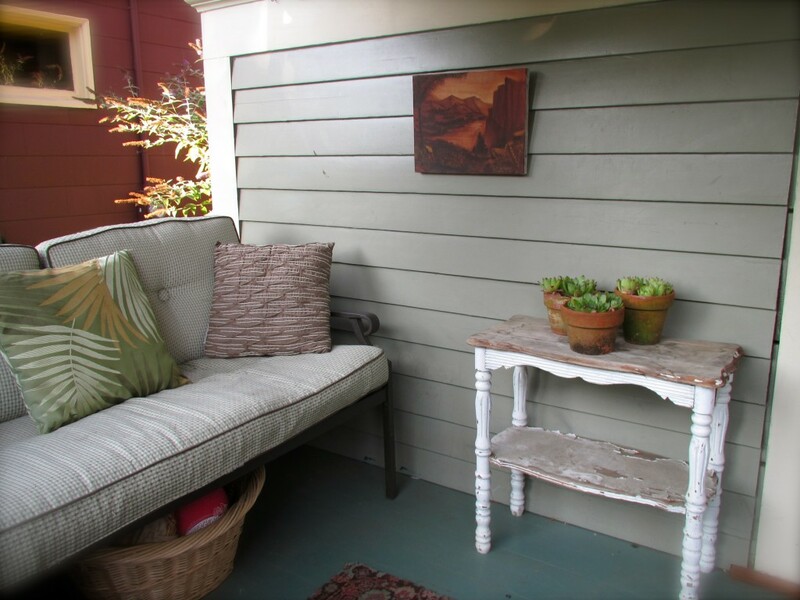 I am awed and inspired by your porch! Love, love, love the painted rug! The whole area is so inviting! You have the wheels turning in my head. I adore your blogs and all the comments from your readers, too!